In 1937 a young, snugly be-sweatered Lana Turner briefly sashayed across the screen of They Won't Forget, and a nation of men demanded to know just who "the sweater girl" was and where they could see her again. Turner's "sweater girl" look established her as a force to be reckoned with, and her siren style endured well throughout the 1960's. There is no reason why we can't have Lana's style today. Vintage patterns give we modern stitchers the opportunity to capture that gilded Hollywood style without exorbitant vintage store prices or the problems attending aging organic materials. 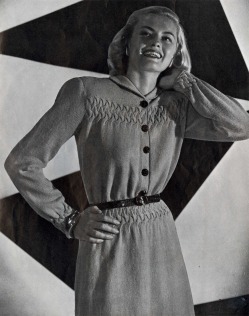 At Sweater Girl Knits, we scavenge the estate sales, auctions, musty bins and basements to bring you the most stylish vintage patterns around. Browse our patterns to find that perfect vintage style for your fashion needs. Are you new to vintage knitting and crochet? Be sure to check out the links on our Resources page, and read our Vintage Knitting Blog - then use your new skills to try out one of our great free patterns!